FINTONA’S Aaron Johnston and driver, Oliver Solberg, produced a stunning debut drive in their Subaru Motorsports USA WRX STI, to claim second place overall in the 100 Acre Wood Rally in Missouri. The 24-year-old Tyrone co-driver and his 17-year-old pilot had to overcome a couple of challenges during the event, including a puncture and a tempermental bonnet, but they still managed to seal a podium finish in some style. Having won the opening two rounds of the Baltic Championship onboard their Volkswagen Motorsport R5 Polo, the pair certainly weren’t lacking in confidence ahead of the weekend’s action in America. They immediately settled into what was Oliver’s first ever gravel rally in a four-wheel drive car and, of course, his first ever event driving the Subaru, which was finished with the same livery as his father, Petter’s 2003 WRC winning machine. Joint fastest on Friday’s opening spectator stage, Oliver and Aaron were just three seconds down on team-mate and American rally king David Higgins when they hit the dirt for the first time. By stage five, they were winning stages, showing the speed of champions and the maturity of a seasoned professionals. They went on to win five more stages over the next day and a half of the Salem-based rally and, had it not been for losing a minute with a puncture and his bonnet–hood blowing up and smashing the windscreen, it could so easily have been a debut win. 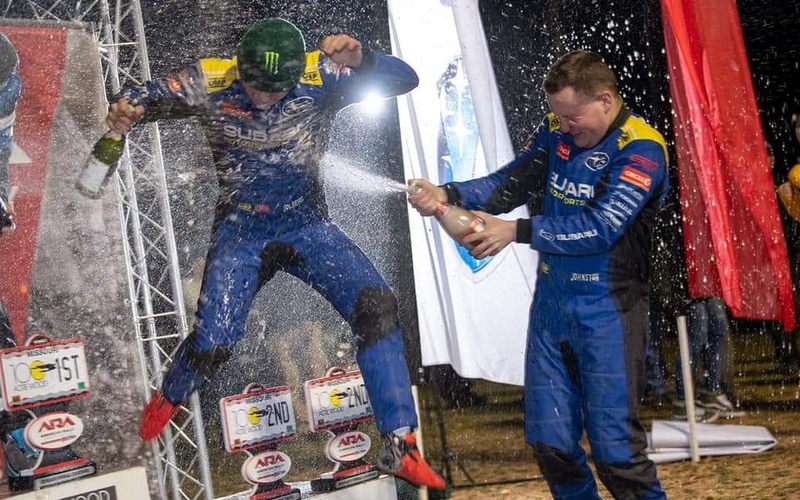 In the end, an all-Irish crew pipped them to the top step of the podium as Leon Jordan and Barry McKenna took the honours on this occasion, while Solberg and Johnston’s team-mates, Higgins and Craig Drew were third overall. Oliver and Aaron will return to the US for the Olympus Rally in Washington on April 27 and 28.